Home | Penmaenmawr Tourist Information and pictures of Penmaenmawr, Conwy County, Wales. Penmaenmawr Beach: The sands of Penmaenmawr beach stretch some four miles from the Penmaen-mawr headland in the west to the Penmaen-bach headland in the east. The recently modernised promenade is the showpiece of this clean, well-maintained beach. It has many attractive features, with its landscaped terraces, flower borders and grassed areas. Remembering its Victorian past Penmaenmawr offers beach chalets for hire. There is a cafeteria, an amusement arcade and an outdoor paddling pool and play area, all helping to make the promenade a pleasant location for a family day out. North Wales Coastal Path: For walkers and ramblers the footpaths in the uplands of Penmaenmawr (including the North Wales Coastal Path) are the gateway to many beautiful areas of Snowdonia National Park and the Conwy Valley. Head east through the Sychnant Pass to the Conwy Valley, west to Llanfairfechan and the Aber Valley, or follow the trails south to the Roman Road and the foothills of Snowdonia. Penmaenmawr Sailing Club: For the more adventurous the local sailing club offers sailing, windsurfing, and canoeing and the seafront is renowned for its magnificent views of both Llandudno's Great Orme and the Menai Straits. Penmaenmawr Golf Club: Playing a round of golf at Penmaenmawr Golf Club is yet another opportunity to enjoy the views of the North Wales coast. The course offers fine views of the Great Orme in the east and the Isle of Anglesey in the west. Fishing in Penmaenmawr: The Graiglwyd Springs Trout Fishery is located on the hillside above Penmaenmawr. The fishery has gained a national reputation for excellence in fly-fishing and is open throughout the year. The two and a half acre lake is located on the edge of the Snowdonia National Park in scenic and picturesque surroundings. As with much of the coastline of North Wales, Penmaenmawr beach is popular with the hardy anglers, forever seeking that elusive Sea Bass. Mountain Bike Trails: There are many trails in the Penmaenmawr hinterland, ideal for considerate Mountain Bikers. Penmaenmawr also has a great sense of history that stretches back much further than the Victorians! Take the short climb to the top of the hill behind the town to see the true beauty of Penmaenmawr and to understand just a part of it's history. Find the Bronze Age stone circle in its magical setting on the edge of the Snowdonia National Park. The Druid's Circle, as it is known, dating from the 2nd millennium BC, is just one of several Bronze Age monuments to be found, some were used for burials and others for various rituals including human sacrifice. It is worth the climb to the top of the hill for the views alone. It is no wonder ancient peoples chose Penmaenmawr to build their temples! From here it is but a short distance to another wonder of ancient Wales the Craig Lwyd stone age site. Located further west than the Druid's Circle the site was one of the biggest "factories" for the manufacture of stone axes in Britain in the 3rd millennium BC. Legend of the Drowned Palace of Helyg: Penmaenmawr has it's very own legend. At low tide rocks appear in the sea off Penmaenmawr which are said to be foundations of a palace belonging to a wicked prince named Helyg (sometimes Helig). Once or twice a year at the lowest of spring tides petrified tree stumps can be seen, all that remains of the ancient verdant valley where Helyg once held court. I include one of several versions of the legend. Prince Helyg, the son of Clannawg, lived in his palace among his people. He was an evil man who for fun captured and tortured peasants from neighbouring villages. He murdered them in violent orgies for his entertainment. One day just as another massacre was about to take place, the prince's wickedness was punished by the sea. A gigantic wave thundered in from the north and engulfed the village in darkness, it claimed the lives of the inhabitants of the palace, and as the raging waters destroyed the buildings, it drowned the evil revellers, prince Helyg and his henchmen were killed outright. Mercifully, the intended victims and other survivors triumphed, they scrambled ashore when the sea calmed, climbed up on to Trwyn-yr-wylfa and sat, watching and weeping as their homes disappeared. Following the disaster Helyg's sons embraced a religious life: Celynin has a church dedicated to him at Llangelynin in the Conwy valley; Rhychwyn is the saint associated with Llanrhychwyn church; and Bodfan, to whom the church at Llanaber near Barmouth is dedicated. Whatever the truth of the legend, I can confirm there are ancient tree stumps visible off the North Wales coast during spring tides. I have seen them myself. Moreover, after visiting all three churches (coincidentally they are three of the most atmospheric of Welsh Churches) I can well believe that the founder of each church was afraid of the incoming sea. Each sits high on a hill. 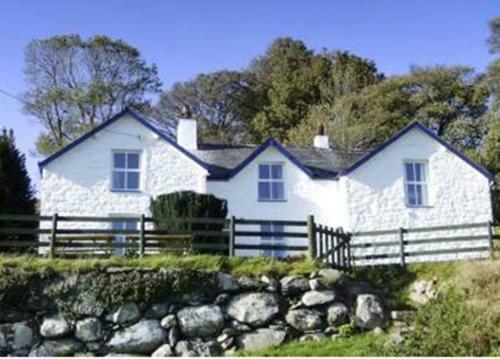 You may make an instant secure hotel or cottage reservation close to Penmaenmawr. Hotel and cottage availability and letting rates are confirmed online prior to booking. Simply click through to the accommodation page, choose a suitable property, check availability, including dates of stay, to confirm the exact room rate and reserve the accommodation.